^ 美国之音. 建国史话 (56) ：杰克逊总统与其副总统的分歧. VOA. Mar 21, 2009 [2009-03-22]. ^ Paul Leicester Ford, The Writings of Thomas Jefferson 10 vols.（New York, 1892-99）, 10: 331. ^ Remini, Robert. 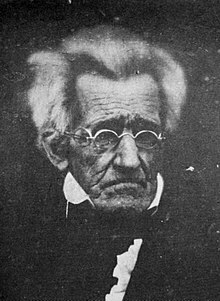 Andrew Jackson and his Indian Wars. 2001 （英语）. ^ Remini, Robert. 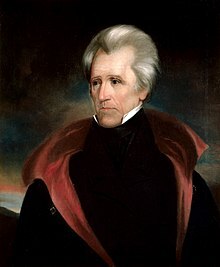 Andrew Jackson: The Course of American Freedom, 1822-1832. : 1–3 （英语）. Bassett John Spencer, ed. Correspondence of Andrew Jackson Vols. 1-6. (1926). Smith Sam B., and Harriet Chappell Owsley, eds. Papers of Andrew Jackson . Knoxville: University of Tennessee Press, Vol. 1, 1980; Moser Harold D., Sharon MacPherson, and Charles F. Bryan Jr., eds. The Papers of Andrew Jackson. Vols. 2-4. Knoxville: University of Tennessee Press, 1988. Brustein, Andrew. The Passions of Andrew Jackson. New York: Knopf, (2003). Hammond, Bray. Andrew Jackson's Battle with the "Money Power" (1958) ch 8, an excerpt from his Pulitzer-prize-winning Banks and Politics in America: From the Revolution to the Civil War (1954). Hofstatder, Richard. The American Political Tradition (1948), chapter on Jackson. Latner Richard B. The Presidency of Andrew Jackson: White House Politics, 1820-1837 (1979), standard survey.